Dated logo, bland colors, non-responsive website. Sound like your business? If so, it might mean a new look is in order. Don’t stress – a corporate rebrand can be fun. Sure, it’s hard work and it’s a bit intimidating at first, but it’s well worth the challenge. Define your mission. If there’s one thing businesses often forget, it’s how to sum up their offerings in 20 words or less. Take the time to define, or redefine, your mission and use that as your develop your new brand. And a little old fashioned brainstorm never hurt anybody, so take an hour to sit with your team (no laptops invited) and really dig deep into your brand. Remember your identity. As the times change, so does corporate design. But instead of jumping on every change or trend, let your creative team explore design options that work for your brand now and 10 years from now. Stay practical and true to your company’s personality, and don’t be persuaded by what’s hot this week. Start from the inside out. A new look can be confusing for employees, so it’s important to make sure your team understands why the rebrand happened, and what the new look and feel means. Take the time to educate every department on how the rebrand affects their day-to-day work, and what they can do to help customers understand the changes. 10 seconds until launch. The launch of your rebrand can be daunting, but taking the time to develop a project plan, budget and timeline will pay dividends at the time of the launch. If possible, a general rule of thumb is to launch the entire rebrand simultaneously so there is little to no confusion about what is old and what is new. There will always be backlash from confused customers, but a fresh look is best achieved when everything is released at once. Tell everybody! 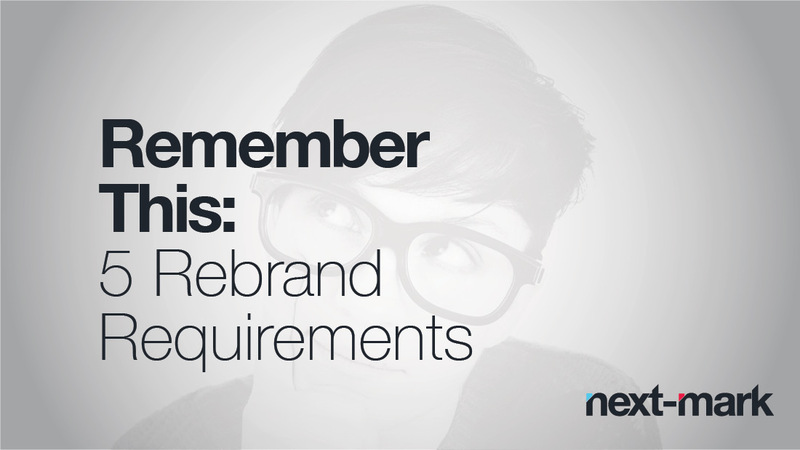 Your rebrand shouldn’t be something you try to hide. Be proud of your company’s new look and share your enthusiasm with the world. Use your social channels, website and even newsletters to encourage consumers to explore your new logo, colors, website, collateral, etc. Your brand is your first impression. Take the time to consider how you want your customers to see you in the marketplace, and make sure your new look is sustainable. If your company is in need of a facelift, we’re happy to help. We’re just about to start a rebrand of our own so we’ll be right there with you.